Chronicling the journeys of our foster dogs as we try to find each dog a forever home. Lucy, the mother of the 7 pups, is doing great! She has gained enough weight that her bones no longer protrude. 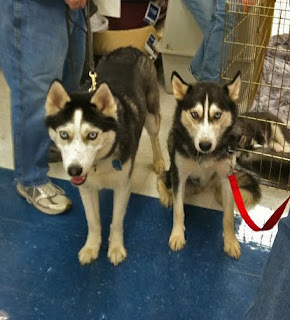 She also went to her first event today - photos with Santa at SuperPetz in Bethlehem. Here she is with Zack, who was also adopted from Harnessed to Hope by a Harnessed to Hope volunteer. Lucy is on the right. Thanks fur allowing her to be safe and loved! AND FUR SHARING HER WITH US! They are some fantastic looking dogs, glad they are in good hands! We are a non-profit rescue for northern breed dogs. We work in PA, MD, DE and NJ. Get our Adoptable Dogs widget and help to get more publicity for our dogs! Make a donation, it's tax deductible! Click here to sign up for the Harnessed to Hope Northern Breed Rescue Newsletter! Get an Email When this Blog is Updated! Our Dogster Page! Make Us Your PupPals! Click on any of the links below and make a purchase and HTHNBR earns a commission. If you have a Food Lion MVP card, click here to find out how to help HTHNBR each time you shop!